MILITIA fighters descended on a village in Central Mali before dawn on Saturday, killing at least 134 people in the latest deadly attack blamed on an ethnic militia, local authorities said. The massacre in the village of Ogossogou left the village Chief and his grandchildren dead in the ethnic Peulh community, according to a local official who had received detailed accounts from the remote area. The victims “included pregnant women, young children and the elderly,” according to Abdoul Aziz Diallo, President of a Peulh group known as Tabital Pulaaku. It was not immediately possible to independently corroborate the toll given by those in contact with survivors from the Peulh village. The UN mission in Mali confirmed reports of an attack but gave no figures. 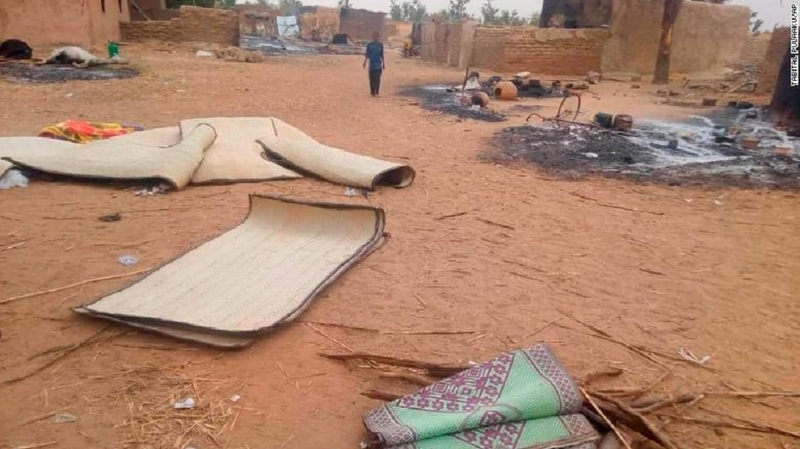 Militants from a Dogon group known as Dan Na Ambassagou have been blamed for scores of attacks over the past year, according to Human Rights Watch. The umbrella group comprises a number of self-defence groups from the Dogon villages among others. The growing prominence of Islamic extremists in Central Mali since 2015 has unravelled relations between the Dogon and Peulh communities. Members of the Dogon group accuse the Peulhs of supporting these jihadists linked to terror groups in the country’s north and beyond. Peulhs have in turn accused the Dogon of supporting the Malian Army in its effort to stamp out extremism. In December, Human Rights Watch had warned that “militia killings of civilians in Central and northern Mali are spiraling out of control.” The group said that Dan Na Ambassagou and its leader had been linked to many of the atrocities and called for Malian authorities to prosecute the perpetrators. MALI’S Government on Sunday announced the sacking of senior military officers and the dissolution of a militia, a day after the massacre of more than 134 Muslims, including women and children. Prime Minister Soumeylou Boubeye Maiga said new military chiefs would be named, and that the Dan Nan Ambassagou association, composed of Dogon hunters, had been dissolved. The dissolution of the militia was to send a clear message, Maiga told journalists: “The protection of the population will remain the monopoly of the state.” Survivors of Saturday’s attack said ethnic Dogon hunters carried out the deadly raid in Ogossagou, a village in central Mali inhabited by the Muslim Fulani community. Maiga did not name the senior officers sacked, but defence ministry sources told AFP they were the Armed Forces Chief of General Staff M’Bemba Moussa Keita, and chiefs of the Army and the Air Force. The Prime Minister’s announcement came hours after an emergency meeting called by President Ibrahim Boubacar Keita in response to Saturday’s massacre, in which at least 134 men, women and children were killed. The victims were shot or hacked to death with machetes, a security source told AFP. It was the deadliest attack since the end of the 2013 French-led military intervention that drove back jihadist groups who had taken control of northern Mali. The massacre took place as a delegation from the United Nations Security Council visited the Sahel region to assess the jihadist threat there. “The Secretary-General is shocked and outraged by reports that at least 134 civilians, including women and children, have been killed,” Antonio Guterres’s spokesman said in a statement, on Saturday. The UN chief called on the Malian authorities “to swiftly investigate it and bring the perpetrators to justice”, the statement added. Guterres’s spokesman said the UN mission in Mali, MINUSMA, provided air support to deter further attacks and assisted with the evacuation of the injured. Earlier, the UN said the visiting ambassadors from the Security Council countries met on Saturday with Maiga and discussed with him the volatile situation in the centre of the country. The attack was launched at dawn on Saturday in the village near the border with Burkina Faso, in a district that has been the scene of frequent inter-communal violence. While local attacks are fuelled by accusations of grazing cattle on Dogon territory and disputes over access to land and water, the area is also troubled by jihadist influence. In the past four years, jihadist fighters have emerged as a threat in central Mali. A group led by radical Islamist preacher Amadou Koufa has recruited mainly from the Muslim Fulani community. Since then, there have been repeated clashes between the nomadic Fulani herders and the Dogon ethnic group. Last year that violence cost the lives of 500 civilians, according to UN figures. In January, Dogon hunters were blamed for the killing of 37 people in another Fulani village, Koulogon, in the same region. The Fulani have repeatedly called for more protection from the authorities. The Government in Bamako has denied their accusations it turns a blind eye to — or even encourages — Dogon attacks on the Fulani. Once considered a beacon of democracy and stability in Africa, Mali in recent years has been dogged by a coup, civil war and Islamist terrorism. Extremists linked to Al-Qaeda took control of the desert north in early 2012, but were largely driven out in a French-led military operation launched in January 2013. In June 2015, Mali’s Government signed a peace agreement with some armed groups, but the jihadists remain active, and large tracts of the country remain lawless. Despite the presence of UN peacekeepers, a strong French military contingent and the creation of a five-nation military force in the region, jihadist violence has not abated.